How would you describe yourself? Who is Gary Wilkins? I am a retired Sound Recording Technician. I have worked in the film and television production industry since 1965. I was born in Melbourne Australia in 1947. My father was a motor mechanic and a film projectionist. He and my mother used to earn weekend money working for a man who ran country movie shows. When I was 3 years old, they would take me. I would go to the projection room with my father. He would operate the huge black steaming projectors which to me were amazing things. I thought he was amazing to be able to do that. My mother sold the tickets and was the usherette during the films. Those are some of my earliest memories and I still get a thrill when I see big 35 mm projectors running a film. I left school at the age of 16 and did photography at RMIT (Royal Melbourne Institute of Technology). It was a night class. There were no formal training paths for a career in sound it was on the job training and self-education. I was fortunate to get work at Crawford Productions in Melbourne. This meant working on their now famous television show Homicide which ran for ten years. The company trained people as technicians. This enabled Crawford's to supply their own needs as the company expanded. A trainee experienced work in every department. This helped them to gain an understanding of the production process. They would then specialise in a particular field of work. This was very valuable experience. I worked on hundreds of episodes of film and television drama. Other projects ranged from live shows, radio, television, music recording, live symphony concerts. I received a broad grounding in all aspects of sound production. This is not possible today. I took courses in photography and electronics. I would read anything about sound or films that I could get my hands on. This included translated Russian textbooks! I read pamphlets about equipment. I would chat with engineers, operators, and salesmen whenever the opportunity arose. If there was something I didn’t understand I would follow it up. I would read textbooks on psychology, medical texts on the ear and hearing perception. I began to realise the link between hearing and emotional responses which I then applied to my work. When we met, you recognised that I had a Cochlear Implant and seemed to be aware of the technology. What's your fascination with them? They are a marvellous invention. They enable people to experience the beauty of sound to a greater degree than they would have been able to. I am interested in how this device has helped people and what changes to their lives it has made. My father became deaf due to his wartime experiences but we shared a love of sound and films. I enjoyed finding ways to help him experience it. The future of Cochlear Implants looks very promising. I have always been conscious of people with hearing impairments. I have tried to reach out to them with my sound recordings by making them as clear and crisp as possible. Other engineers tried for the absolute highest quality sound. I always went for maximum speech legibility. A lot of 1930-40’s films are very clear in their dialogue. This is because there are frequency bandwidth limits. Actors were more careful to annunciate their lines. One of my neighbours in Melbourne once told me she was tone deaf. She never went to see Australian movies. She had difficulty understanding the dialogue in them. One day she called in to tell me that had been to see Breaker Morant because I had recorded it. She told me she had understood every word. That to me was one of the most satisfying compliments I have ever received. Freezing in sub zero Tasmania on “Noah’s Ark” 1999 using Audio Developments 8 channel mixer and Fostex PD-2 DAT recorder. Luckily these machines had internal heaters. When did your interest in sound begin? As a teenager, I found an old gramophone which my father had built before the war. I played around with it and got it going and used to play his collection of 78 records from the jazz era. I would listen to them for hours at a time and began to follow individual instruments. From this, I learned a love of music. But, also how to listen in an analytical way by concentrating on a particular aspect of the sound. This was a great bonus to my future career. When did you realise you had a passion for sound and audio? When I was working for Crawford Productions: I started in the sound department operating projectors. We spent most of our time in the recording studio. When they began to record sound on location for their productions none of the other guys wanted to do it. I liked it because I got issued a car and I was outdoors a lot in different locations. I was working with the actors on the set. I told my boss Hector Crawford that I wanted to specialise in this aspect of production and he was wise enough to support me. I received training from an experienced technician. At 22, I became the chief recordist. I was responsible for the sound production crews on five productions at the same time. Take a look at IMDB (The International Movie Data Base). You will see a lot of my track record in relation to the movie industry. But, there are many other things I worked on. These include over 800 international TV commercials and several television shows and documentaries. The most recent was the Steven Spielberg – Tom Hanks production of The Pacific for HBO (Home Box Office). At the time it was the most expensive television series ever made. I co-recorded with a colleague and four of our episodes got nominated for best sound in the Emmy Awards. was on first name terms with many of the world most famous actors and directors. You become like a family in the somewhat rarefied atmosphere of the movie set. They are all professionals. We spent long hours each day together struggling to perfect our craft under extreme pressure. So you become quite friendly in those cases. I needed the actors and directors to trust my judgement as a professional at times. A good rapport with them was vital to our success. The rim of Rano Raraku volcano, Easter Island, Chile for Rapanui. 1994 Using Nagra IV-S and Fostex PD-2 DAT recorder with Audio Developments 8 channel mixer. This location was on the most remote inhabited island in the world so I used twin systems as a back up because we were a long way from help if anything failed. We only had two supply aircraft a week and I would send the recorded DATs on one flight and the magnetic tapes on a later one in case of mishaps. Everybody is unique which is beautiful. I was once referred to as "A single-minded gentleman" when it came to sound. I reasoned that I was not much good at anything else so I had better concentrate on perfecting the tricks that worked best for me! When you worked with actors on set. What did you notice about their communication? Would you describe them as good communicators and easy to understand? Did you get your fair share of mumblers? Yes as I mentioned, legibility is the key factor in communications. So I would often not work with the script on my desk. I tried to judge the dialogue as a first-time listener. The audience only gets one pass at it and they don’t have the script to help them. Directors and actors read and rehearse the script. This is for sometimes hundreds of hours before they perform it. I did not want to learn it as I felt I was the representative of the audience. If a line of dialogue was indistinct I would point it out to the director and play them the recording as an example. Then suggest that the actor slowed down the delivery or changed the emphasis a little to see if it worked. The directors and actors appreciated this feedback. You had to be diplomatic because you were interfering in their art. I learnt from other actors how to speak in terms that actors understood. I tried not to scare them with technology and let them know that I was there there to assist them. Tropical heat and torrential rain in Penang, Malaysia for Paradise Road 1997 using Audio Developments 8 channel mixer and Fostex PD-2 DAT recorder. Note the black and white cooling fan for the recorder. They used to over heat in the tropics and Australia. Sometimes a director would hand direct responsibility to me. I worked on the movie called, The Year of Living Dangerously. We had an actress, Linda Phipps Hunt. She played a male Chinese cameraman of short stature. Mel Gibson and Sigourney Weaver also starred in the movie. Mel, who is Australian, had a transpacific US / Australian accent. Sigourney, who is American, was playing an English girl. Both performances I had to keep an eye on. Linda was playing a man. Linda was a stage actress and could project her voice, but it sounded very feminine and shrill. So I suggested she speak softer and use a lower register. We worked on this together and this involved some technical effort. The director, Peter Weir, was nervous about portraying the masculinity of the character. So I arranged with the casting department to hire lighting stand-ins for Linda. These were men of short stature and about the same age as her character. Then I would introduce them to Peter and have a chat with them. After I would point out to him that their voices were all higher pitched than the voice we were getting from Linda. He finally agreed not to dub her voice with a male one. That year Linda won the academy award for her role in the film. That may not have happened if I had not fought for the use of her voice. This helped to preserve her brilliant performance. I am very proud of that result. You have worked on many movies and your career moved to Hollywood movies. When and how did you make this breakthrough? Tell us more about it. I had built a good reputation in Australia. After leaving Crawford Productions to go freelance, we worked on a film in New Zealand. 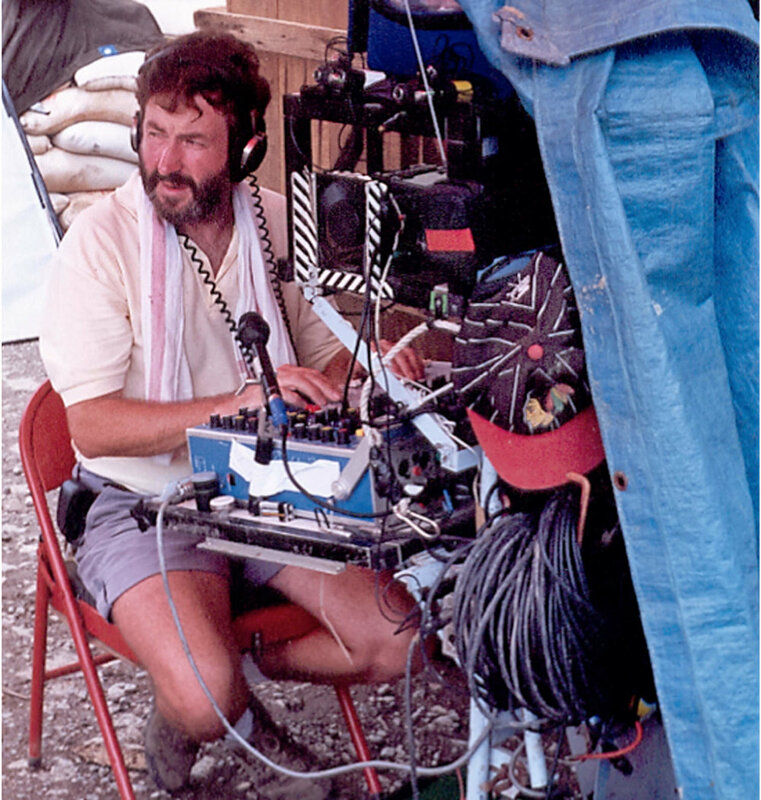 The producer Brian Cook was Stanley Kubrick’s first assistant director. He was about to start a movie in Thailand called Casualties of War, The director was Brian De Palma and featured Michael J. Fox and Sean Penn. It was our first real Hollywood production. My assistant Mark Wasiutak and I were the only two Australians on a half British half American crew. They were all top professionals having worked on Star Wars: Episode IV - A New Hope and Rambo: First Blood Part II. We were the unknowns. This all changed with an announcement on set. The film called Crocodile Dundee had eclipsed USA weekend box office takings. It had overtaken both Star Wars and Rambo. Coincidentally, I had worked on this movie. I also happened to have a Crocodile Dundee crew cap in my pocket and put it on. After that, we had no further trouble of acceptance by the crews! With that track record, we had now broken into the international sphere of movie making. For about fifteen years, We made a good living working in Asia and the Pacific. We worked on international productions shooting in those regions. Between big jobs, we would work on the lower budget Australian movies at home as well as commercials. We even made two Chinese language films in China when it was opening up to the west. They were Temptation Of A Monk and Soong Sisters Dynasty. It was a fascinating time to be there. What’s your favourite line from any movie? Funnily enough, I was watching a newly minted copy of Mad Max recently. There is a line from one of the bikers. He had trashed a town, terrorised many people as well as chopped a car to pieces when a bystander asked, “ Wow! What happened to that car?” He replies coolly, “ Perhaps it was the result of an anxiety.” I have used that line to great effect over the years. Also the line from Crocodile Dundee: “That’s not a knife… This is a knife.” is a classic but there are dozens of many films that stick in my mind. Women and boats don’t mix. It would have saved a lot of anxiety on both sides! In a book that I have read about yacht racing was a line “The skipper who wins sails a race of his own.” Which I took to mean don’t follow the pack. I have always tried to find my own ways to solve problems. I selected equipment which was different from what most others used. I used a lot of lateral thinking. It was gratifying to find that techniques I had independently arrived at, out of necessity, were being used by the top people in the world who had also made these discoveries. It was an honour to be accepted into the Cinema Audio Society in the USA. which is a select group of only 550 sound professionals working in the film industry. Whats the most fun thing about sound and audio? I enjoy seeing the audience affected by what we have done. On the film Breaker Morant, I chose to use an English style of sound. Breaker Morant is a military courtroom drama set in the Boer War. On my days off, I would visit army bases to record ambient sounds which we used in the film as background. The footsteps of the soldiers crash on the bare wooden floors. Chair scrapes and pens clattering were not suppressed as in a normal Hollywood movie. They did not have enough money for thousands of troops in the background. The audio I recorded at the army bases helped fill them in. The director Bruce Beresford liked it so he encouraged me to use this style and kept it in the film. When I was watching a public screening of the film I “ had my ears on backwards”. I was watching and listening to the audience not the movie. A man sitting behind me remarked to his friend “ Gee they made a lot of noise in those days didn’t they.” It was thrilling that my idea had worked and helped set the realistic tone of the film. It was harsh and real and not a Hollywood sanitised version. We were shortlisted for an Academy Award for sound that year. Not bad for a little Aussie film made on a shoestring. What advice would you give people who want to get into the field of audio and sound work? The main thing you need is enthusiasm. You have to be silly enough to wait on a street corner at 5 am in the pouring rain and then go to work on a movie. This could be for 12 – 14 hours a day! Rapanui using the Fostex PD- 4 and a four channel SQN mixer ( top) for portable work. I always tried to master the technology so it would serve me. I used the best equipment I could afford so it was reliable. I tried to understand what the director was hoping to convey emotionally in the project. I would then find ways to enhance that feeling through sound. I would remain invisible to the production process as much as possible. Problems would be solved quietly without interfering with anyone else’s work. I likened myself to a submarine – invisible mostly but the results become very clear later. I loved getting it right when that happened. To see people responding to the film the way it was intended was very satisfying. I also secretly enjoyed getting my own stuff right when no one else was even aware of what I was doing. Most people have no idea about the impact of sound in movies. Francis Ford Coppola was reputed to have said about sound “ For ten percent of the budget you get fifty percent of the movie.” I just loved it. We also got to travel to distant places and meet exotic people and experience things the general public could never do. It was always exciting to experience new challenges – to find sounds that would stimulate a result in the listener. I still like to watch well-made films particularly sensitive stories with good acting. I am not so fond of the noisy “Crash and Bash -Destroy The World” comic book films that are popular here in Thailand. I like performance oriented stories particularly British films. Their actors pay careful attention to dialogue clarity and acting performances as well as their use of acoustics on location. American sound is very upfront and flat coming more from the vaudeville tradition. The British and European sound is more subtle and acoustically true to the environment. British actors love the spoken word – this comes from their Shakespearian tradition. I could do both styles depending on the job requirements. Your five favourite movies? Why? It's very hard to name five. Of the 80 plus movies I worked on each was like one of your children – with its own different problems and successes. Some of the least commercially successful jobs I worked on involved a lot of care and attention and I am proud of what we achieved. To single out a few examples only two below are my work. Breaker Morant: It was on a shoe string budget but everything worked perfectly to make a unique production. The film also helped put the Australian movie industry on the world scene. Zulu for the excellent recording and use of sound as well as a cracking story. Those guys did great job on it. I wished I could have worked on it. Lawrence of Arabia for the sheer magnificence and scale of it. The emotional impact of seeing it in a big screen theatre for the first time inspired me to want to work on jobs like that. South Solitary: A relatively unknown Australian love story set in a remote lighthouse in the Southern Ocean . This was one of my last films. It was very challenging both technically and physically. But every word spoken in the film is a live recording. There was no dubbing involved. The Grand Budapest Hotel: A Comedy made in the European style with great acting and dialogue. There are performances by many well known actors but you would find it hard to recognise many of them in this off beat story. I love the style of this zany film. Recording Kangaroo Jack 2003 in Sydney again on the Audio developments Mixer and Fostex PD-2. The technology mounted on the sound cart would be modified according to the requirements of the job. I have had an interesting life which has been very satisfying in general. It is hard to name one thing. I suppose latterly it was moving to Thailand with my lovely Thai wife. It has brought me great pleasure and a new interest in another culture and way of life. There is still so much to learn about this country, the world and myself. Blue. Strangely, I seem to gravitate towards it. I never wear green. Coldplay, Paradise: I first heard it on Youtube in a clip about flying into Wellington New Zealand called” This is why we fly..” It has stuck with me ever since. A superb example of music adding an emotional dimension to a grand vista. Anything of theirs is great. Ella Fitzgerald and Louis Armstrong, Baby it's Cold Outside: The rapport they have with that song is tangible. They are enjoying it. The singers of that era really knew their craft. Anything of either of them is great too. Katherine Jenkins, In the Arms of an Angel: A beautiful sounding voice and so well modulated with classical training. I love opera and simple folk songs too and just about anything else. I have a few exceptions such as rap music which I find too aggressive. Also, some country and western styles sung by Australian singers who put on false American accents. I like good well crafted music of most flavours. Minnie Riperton, Loving You: Takes me back to the 70’s. So peaceful and soothing and what a great vocal range. The Eagles, Hotel California: I grew up with them. I still use their reunion concert DVD to calibrate my home cinema system. Anything of theirs and also the Beach Boys. You can understand the lyrics. My digital recoding set up for the last day on The Pacific 2010 after 10 months. Using two Zaxcom Cameo 8 track digital mixers. I was mixing 14 microphones down to an 8 track Zaxcom Deva 4 Hard Disk recorder. Above is a rack of 12 wireless microphones feeding into the mixers. The blue screen is a video monitor from the main movie cameraso I could follow the action. I built all my own carts as they suited my style of work better than manufactured ones and could be adapted to the requirements of each different job.These two $25,000 mixers became obsolete after this job and had to be replaced with a newer one. What effect has your career had on your hearing? After almost fifty years of exposure to gunshots, explosions and screams I have developed Tinnitus (ringing in the ears). This is common among musicians and people of my profession. It is not very pronounced. It does not annoy me although I like to have the radio on softly at night when I go to sleep to mask it. There is also a loss of frequency response due to industrial damage. Every professional engineer will tell you it is necessary to have the sound at high levels if you are listening critically. There is a ratio of exposure time versus loudness which should not be exceeded to avoid hearing damage. Unfortunately, the kind of hours we keep in the film industry do not make this possible. Over the years damage and hearing loss will occur. I became conscious of this. I then tried to reduce the level of listening and exposure time as much as possible particularly with digital systems. But by the age of 60, I knew that my hearing was well down – this is also a naturally occurring factor of age. By 63 I felt that I could no longer rely on my hearing to be as accurate and as honest as I wanted. So I decided to retire before any problems developed further. I have seen sound operators hang on well into their 70’s. Some have crashed their careers spectacularly and I wanted to avoid that. I had a good run on large productions and was in a financial position to be able to retire comfortably. It was also a time of change personally. I felt I had taken my career as far as I wanted to. I looked to move on to other challenges as well as preserve the precious remnants of my hearing. In 2018, I am looking forward to the arrival of a new concept in headphones which adapt to your degree of hearing loss to a point and compensate for it. I am hoping to rediscover aspects of listening which I have slowly lost. I am very excited at this prospect. This technology originates from Melbourne actually and is soon to launch worldwide. There were so many incidents which occur when you are trying to do things that are out of the ordinary. You are also dealing with actors who are, in the main, colourful personalities. We were filming a show about a character like Sherlock Holmes who was the master of disguise. Our leading man Gordon Chater would dress as an elderly dowager for a street scene. At lunchtime, he treated the whole crew to afternoon tea at a very exclusive tea room in Melbourne. He would dress as a Dutchess and stay in character for the whole time. We found it highly amusing as the staff fawned over him not realising he was a man! On Casualties of War in Thailand, I went out into the jungle alone to record ambiances for the film. Its a thing I love doing - you place microphones out on a perimeter and sit still and listen. I record for a couple of hours. You can hear the most amazing things sometimes. At work using the Nagra IV-S analogue tape recorder during the late 1980’s. What skills and techniques did you apply in your career? Technical listening skills were essential to my craft. I was able to identify various brands of magnetic recording tape by its background surface noise. Mentally I used to burrow down through the layers of sound, Foreground, Middle ground and Background to reach the "Noise Floor". This is when hearing happens in the brain. The ears are transducers converting acoustic energy into electrochemical signals. The signal requires interpretation by the subconscious. They are analysed and forwarded to the conscious brain. My friend is an Audiophile. He once played me a range of recordings. I was able to identify the type, model and make of the microphones used by the sound of the voices. I admire musicians who have these listening skills with instruments too. I admire anybody who can do something I cannot. At the same time, I had to listen to the legibility of the performances and the veracity of the accents used. It is a common misconception that movies are re-voiced or re-recorded. When you are paying $250,000 a day for someone like Sean Connery you want to be able to use everything he says. Re-voicing is often done for technical reasons and also for performance. But, the original sound will still be laid up for the final mix as well. Often the director will accept a lower technical standard. This will be in favour of a better performance. This is what it is all about to me. A captured moment of emotion. I started when optical sound was phasing out. That was the sound being photographed onto the film like the image. I progressed through the Nagra portable ¼ inch magnetic tape recorder stage which lasted for 20 years. Then I had to learn the new technology of DAT ( Digital Audio Tape ) which was a modified video format when introduced. I finally moved to computer-based digital hard disk recording. This was a big step forward and now the newest equipment has no moving parts at all. The intensity of digital sound also hastened the demise of my hearing loss. One of my main tasks was to keep these delicate machines operating at top performance. This was in some very harsh conditions ranging from -26 deg C in Mongolia to +50 deg C in central Australia. Today 2017 life has taken a new direction for me and I am enjoying my relaxing retirement in Thailand. A lot of my technical skills with various machines are now redundant. When I retired I donated all my equipment to the National Film and Sound Archive in Canberra, Australia. It is preserved as a complete collection of film recording gear from 1970 to 2012. I hope it will be of interest to future generations of film makers.